Anchoring and adjustment is a psychological heuristic that influences the way people intuit probabilities. Traders exhibiting this bias are often influenced by their initial opinions, the initial trend, or arbitrary price levels such as their entry or target prices – and tend to cling to these numbers when making their buy/sell decisions. This is especially true when the introduction of new information regarding the security further complicates the situation. Rational traders treat these new pieces of information objectively and do not reflect on purchase prices or target prices in deciding how to act. Anchoring and adjustment bias, however, implies that investors perceive new information though an essentially warped lens. They place undue emphasis on statistically arbitrary, psychologically determined anchor points. Decision making therefore deviates from neoclassically prescribed “rational” norms. For example, traders who are anchored to the initial trend are slow to catch on when the trend has reversed, especially if they are caught on the wrong side of it. This will lead to a reluctance to change their view and reverse their positions. How will this affect your trading? Traders who are anchored to price levels, such as their entry price, will refuse to cut their losses until prices go back to the entry price which they have anchored to. Traders may also refuse to take profit at a less desirable price because they missed the chance to take profit at a more favourable price, and they have now anchored to that price and refuse to settle for less. The key to overcoming this bias is to be flexible and objective, being able to evaluate prices and make decisions objectively, whether you are in, out, up or down. http://synapsetrading.com/wp-content/uploads/2014/03/logo-header1.png 0 0 Spencer Li http://synapsetrading.com/wp-content/uploads/2014/03/logo-header1.png Spencer Li2011-03-14 03:21:512019-03-07 04:34:36Anchoring Bias - I Refuse to Change My Mind! Overconfidence is the unwarranted faith in one’s intuitive reasoning, judgments, and cognitive abilities. Studies conducted have shown that people overestimate both their own predictive abilities and the precision of information that they have been given. In addition, people are poorly calibrated in estimating probabilities – events which they think are certain to happen are often less than 100% certain to happen. In short, people think that they are smarter and have better information than they actually do. For example, they may get a tip from a broker or read something off the internet, and they’re ready to take action, such as placing a trade, based on the perceived knowledge advantage. If there is no logical basis for the advantage, then this perceived edge does not exist at all, despite what the trader thinks he knows. There are two kinds of overconfidence – prediction overconfidence and certainty overconfidence. In prediction overconfidence, the confidence intervals that traders assign to their predictions are too narrow. An example of this is when gurus try to forecast precise price targets. In certainty overconfidence, traders are too certain of their judgments. For example, after entering a “sure-win” trade, traders become blind to the prospect of a loss, and then feel disappointed or surprised that the trade performs poorly. Always keep in mind that trading is a game of probabilities, and nothing is 100%. How does this affect your trading? The dangers of overconfidence are numerous. For example, if traders overestimate their ability to pick a winning trade, they become blind to warning signs or information that indicate that their decision was wrong. This might make them enter bad trades or hold on to losing positions. If traders believe they have special knowledge, they may also end up trading excessively. Overconfidence can also cause traders to underestimate downside risk, and in worse cases not using a stoploss. If we look at the collective participation in the markets, we find many different kinds of people, different kinds of beliefs, and different kinds of theories. These differences create price movements and patterns. To understand and exploit these opportunities, we first need to understand ourselves. We will then be able to choose the kind of strategy best suited to our personality, and at the same time avoid behavioral biases by being aware of them. A crucial component of any model of financial markets is a specification of how agents form expectations. We now summarize what psychologists have learned about how people appear to form beliefs in practice. Extensive evidence shows that people are overconfident in their judgments. This appears in two guises. First, the confidence intervals people assign to their estimates of quantities – the level of the Dow in a year, say – are far too narrow. Their 98% confidence intervals, for example, include the true quantity only about 60% of the time. Second, people are poorly calibrated when estimating probabilities: events they think are certain to occur actually occur only around 80% of the time, and events they deem impossible occur approximately 20% of the time. Most people display unrealistically rosy views of their abilities and prospects. Typically, over 90% of those surveyed think they are above average in such domains as driving skill, ability to get along with people and sense of humor. They also display a systematic planning fallacy: they predict that tasks (such as writing survey papers) will be completed much sooner than they actually are. There is much evidence that once people have formed an opinion, they cling to it too tightly and for too long. At least two effects appear to be at work. First, people are reluctant to search for evidence that contradicts their beliefs. Second, even if they find such evidence, they treat it with excessive skepticism. Some studies have found an even stronger effect, known as confirmation bias, whereby people misinterpret evidence that goes against their hypothesis as actually being in their favor. In the context of academic finance, belief perseverance predicts that if people start out believing in the Efficient Markets Hypothesis, they may continue to believe in it long after compelling evidence to the contrary has emerged. When forming estimates, people often start with some initial, possibly arbitrary value, and then adjust away from it. Experimental evidence shows that the adjustment is often insufficient. Put differently, people “anchor” too much on the initial value. In one experiment, subjects were asked to estimate the percentage of United Nations’ countries that are African. More specifically, before giving a percentage, they were asked whether their guess was higher or lower than a randomly generated number between 0 and 100. Their subsequent estimates were significantly affected by the initial random number. Those who were asked to compare their estimate to 10, subsequently estimated 25%, while those who compared to 60, estimated 45%. When judging the probability of an event – the likelihood of getting mugged in Chicago, say – people often search their memories for relevant information. While this is a perfectly sensible procedure, it can produce biased estimates because not all memories are equally retrievable or “available”. More recent events and more salient events – the mugging of a close friend, say – will weigh more heavily and distort the estimate. 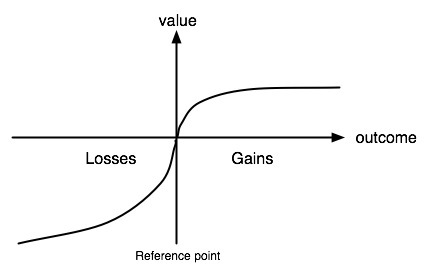 Economists are sometimes wary of this body of experimental evidence because they believe (i) that people, through repetition, will learn their way out of biases; (ii) that experts in a field, such as traders in an investment bank, will make fewer errors; and (iii) that with more powerful incentives, the effects will disappear. While all these factors can attenuate biases to some extent, there is little evidence that they wipe them out altogether. The effect of learning is often muted by errors of application: when the bias is explained, people often understand it, but then immediately proceed to violate it again in specific applications. Expertise, too, is often a hindrance rather than a help: experts, armed with their sophisticated models, have been found to exhibit more overconfidence than laymen, particularly when they receive only limited feedback about their predictions. If you fall under this category, it means that you follow what the rest of the market is often doing. If there is a new IPO that is hot, or one of the stocks just crashed and word on the streets is that it is a hot buy, or there are rumours flying around of inside news that a certain stock will fly then you will do the same as the rest of the market. This is not always a bad thing because the simple answer to this is: But the market should always be right right? Since everyone is following the market. It is not always true but the market is random and BLINDLY following the market is wrong.